With inputs from experts, these worksheets are tailor-made for high school students. 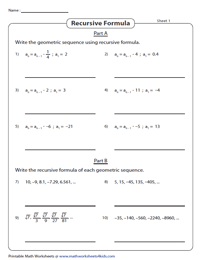 Geometric sequence worksheets are prepared for determining the geometric sequence, finding first term and common ratio, finding the nth term of a geometric sequence, finding next three terms of the sequence and much more. 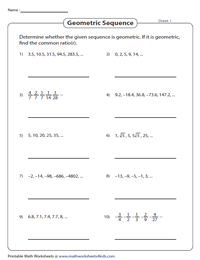 These worksheets require students to observe the given sequence and find the common ratio 'r' if it is a geometric sequence. 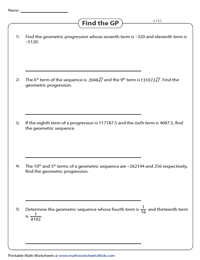 These worksheets combine a sequence of real numbers where students need to find the correct geometric progression from the choices provided. Observe each geometric sequence and find the first term 'a' and the common ratio 'r'. Find the next three terms of each geometric sequence by determining the common ratio of the sequence. Two word problems are included in each worksheet. These worksheets are split into two parts, A and B. Part A requires students to find geometric sequence using the general term. Write the explicit formula of the geometric sequence in part B. Students require to write the geometric sequence using the recursive formula in part A and write the recursive formula for each geometric sequence in part B.
Learners are required to ascertain the specific term (nth term) for each sequence. Validate your responses with our answer keys. 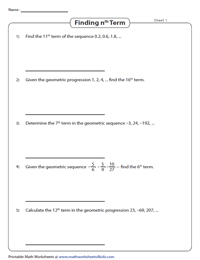 These geometric sequence worksheets require learners to answer a series of word problems like finding the specific term, first term or ascertain the value of n.
Two terms of the GP are given. Find the geometric sequence in level 1 and specific term of the sequence in level 2.